Winning on immigration will not win elections. Fact. It’s all a bit odd. The Conservatives seem to think that they will win the next election by talking a lot about immigration. It makes me want to shake them. Why? Because it won’t and can’t win them the 2015 election, but it can lose them the allegiance of a massive amount of voters for the next 20 years. Here is a stark fact for you. 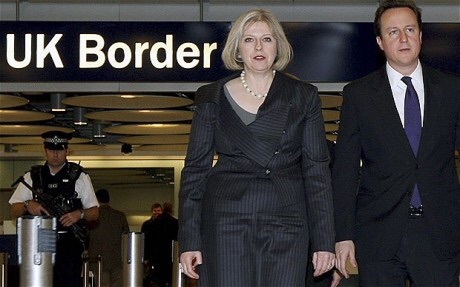 The Conservatives had a 20 point lead in polls on immigration policy going into the 2010 General Election. I won’t need to remind you that they didn’t actually manage to win a majority in that election. Bear in mind that their immigration policy at the time was no where near as harsh as it is trying to be now. Today, the Conservatives’ lead in polls on immigration policy is a bit lower at about 15%. History has shown that even if they get up to a 20 point lead on this issue, it can’t win them an election. What it can do though is put off the 1/4 of those who voted for Labour at the last election who profess themselves to have more confidence in David Cameron as Prime Minister than they do Ed Miliband. To do that, Cameron has to remember the importance of progressive politics, which his commitments to cutting inheritance tax, introduction of the bedroom tax and repeated clampdown on benefits without addressing low pay will not help with. True, 2/3rds of UKIP voters say that Cameron would make a better PM than Ed Miliband, and some of them might actually understand the First Past the Post election system well enough to realise that in their constituency a vote for UKIP is wasted in the General election so they really should choose between the two main parties. You could argue then that the key is to bring in ever harsher immigration policies. But many people are voting for UKIP at the moment not because immigration is too high but because the economy is ‘not working for them’ and they have decided that immigration is the cause of that. Cameron is making the mistake, as is Ed Miliband if you look at the section on Labour’s website on immigration, of giving in on that point. They are essentially saying “there go my people..I am their leader so I must follow them.” A far more sensible measure would be to sensibly and patiently take the time to explain to them what is actually happening, which is that immigration often fills job vacancies that no one else will do, which is that immigration gives us doctors and nurses to keep us healthy and entrepreneurs who create jobs for us as well as buying the products we make. Then do something about low pay, the woeful supply of new housing, and the abuse of monopoly power by privatised utility companies. Cameron, especially, is being drawn into making ridiculous comments about his ability to renegotiate freedom of movement of workers in the EU, as if the entire basis for the EU Treaty will be ripped up because he is stamping his feet and threatening to tell his mummy on them. At some point he must surely be looking himself in the mirror and asking how he got to the point where he is making such ridiculous promises. The truth is that the Conservatives can win votes from many places. Centrist Labour supporters, right wing Lib dems, UKIP voters being among them. But he will only do that by concentrating on a mix of policy areas, not just the one that has been proven not to win elections and proven to make him lifelong enemies in the electorate. « Cameron sinks deeper into EU mess.